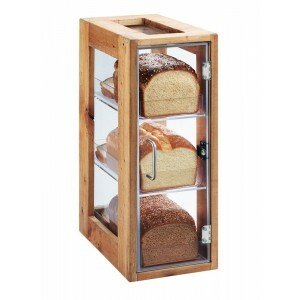 Madera Bread Display - Cal-Mil Plastic Products Inc. This unique bread display features a reclaimed wood frame with crystal clear acyrlic body. It includes three drawers to serve and display fresh-baked breads, pastries, muffins, and more! When used horizontally, these bins are stackable!